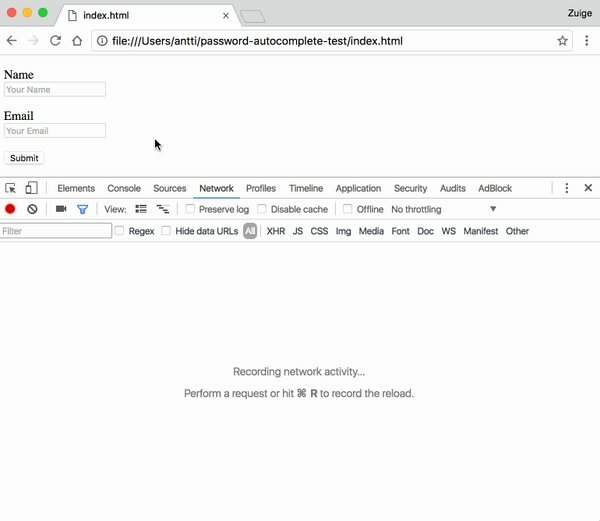 Chrome, Safari, Opera and extensions such as LastPass can be tricked into leaking private information using hidden text boxes, developer finds. Your browser or password manager’s autofill might be inadvertently giving away your information to unscrupulous phishers using hidden text boxes on sites. Finnish web developer and hacker Viljami Kuosmanen discovered that several web browsers, including Google’s Chrome, Apple’s Safari and Opera, as well as some plugins and utilities such as LastPass, can be tricked into giving away a user’s personal information through their profile-based autofill systems. The phishing attack is brutally simple. Kuosmanen discovered that when a user attempts to fill in information in some simple text boxes, such as name and email address, the autofill system, which is intended to avoid tedious repetition of standard information such as your address, will input other profile-based information into any other text boxes – even when those boxes are not visible on the page. It means that when a user inputs seemingly innocent, basic information into a site, the autofill system could be giving away much more sensitive information at the same time should the user confirm the autofill. Chrome’s autofill system, which is switched on by default, stores data on email addresses, phone numbers, mailing addresses, organizations, credit card information and various other bits and pieces. Kuosmanen set up a site to demonstrate the issue, showing a text box for a user’s name and email address, with text boxes for address and phone number hidden from view, auto filled by Chrome. Mozilla’s Firefox is immune to the problem, as it does not yet have a multi-box autofill system and cannot be tricked into filling text boxes by programmatic means, according to Mozilla principle security engineer Daniel Veditz. A complete autofill system is currently in development for Firefox, however. The phishing attack still relies on users being tricked into entering at least some information into an online form, but unsuspecting users could be tricked into entering more than they bargained for relatively easily. Users can protect themselves from this kind of phishing attack by disabling the autofill system within their browser or extension settings.